The Parking Space Levy Act 1992 (“the Act”) imposes a levy on the owners of parking spaces within specified areas of the Sydney CBD and certain surrounding areas. any other space prescribed by the regulations to be a parking space for the purposes of this definition, but does not include a space which is part of the carriageway of any street, road or lane open to or used by the public. For the purposes of the Act, the number of such parking spaces on any premises as are not individually delineated by permanently marked lines is to be assessed in accordance with this clause. In a case where a development consent under the Environmental Planning and Assessment Act 1979 specifies the number of parking spaces that the premises are to contain, the number of parking spaces is the number so specified. In any other case, the number of parking spaces is the number obtained by taking the total area occupied by the parking spaces and dividing it by 25.2 square metres and disregarding any remainder. For the purposes of this clause, any sign or temporary barrier purporting to indicate that a space is not a parking space is not, of itself, evidence that the space is not a parking space. This ruling clarifies what a “space” is for the purposes of the Act. A “space” is any part of any area, and a “parking space” is any space that has been set aside for, or is used for, the parking of a motor vehicle, whether or not that space is clearly delineated or line-marked. In the case of premises with parking spaces that are individually delineated (ie. clearly and permanently line-marked, or distinctly identifiable in any other respect from other parking spaces on the premises) the number of liable parking spaces is taken to be the number of parking spaces that are individually delineated, subject to paragraph 8 below. In the case of premises with parking spaces that are not individually delineated, the number of liable parking spaces is to be determined in accordance with Clause 7 of the Regulations (see paragraph 3 above). in the case of a parking space that has an apparatus on it which allows multiple motor vehicles to be parked one above the other (commonly known as ‘stacked’ parking), the number of liable parking spaces is taken to be the maximum number of motor vehicles that could reasonably be parked in the parking space using the apparatus. If the apparatus is designed to allow the parking of two (2) motor vehicles in a space that would otherwise, in the absence of the apparatus, be considered as one parking space, the number of liable parking spaces is taken to be two (2). in the case of a parking space that allows multiple motor vehicles to be parked horizontally one after the other (commonly known as ‘nose-to-tail’ parking), the number of liable parking spaces is taken to be the maximum number of motor vehicles that could reasonably be parked in the parking space. 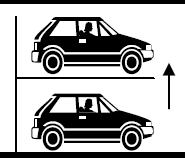 If the parking space allows for the parking of two (2) motor vehicles, the number of liable spaces is taken to be two (2).